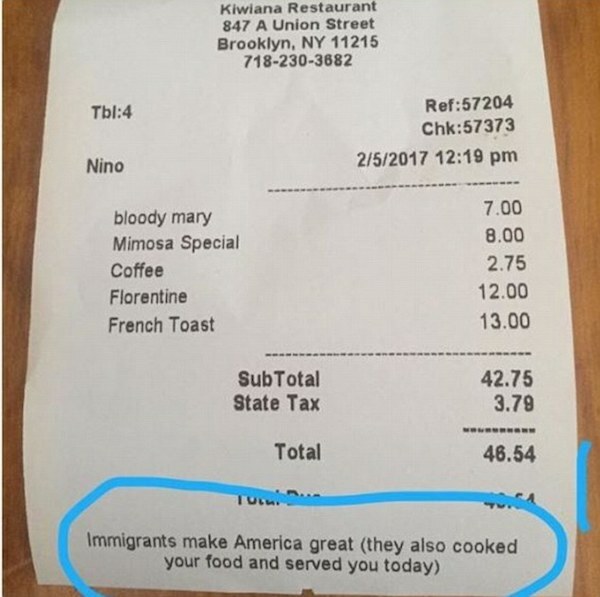 A New Zealand chef based in New York City has weighed in the strict immigration policies in the US, by adding a note to the bottom of each customer receipt. Kiwi woman Mary Emily O'Hara, who ate at Kiwiana cafe in Brooklyn, uploaded a photograph of her receipt with the caption 'Breakfast in Brooklyn'. 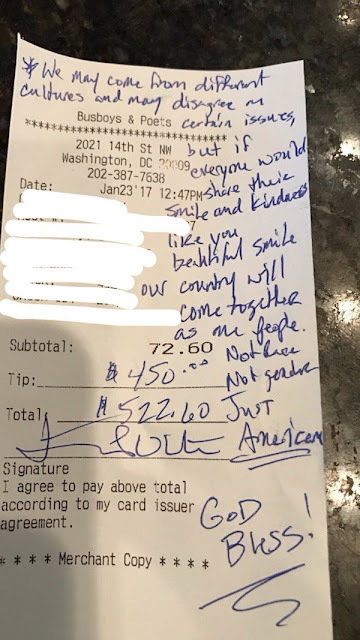 At the bottom of the receipt a note says: 'Immigrants make American great (they also cooked your food and served you today)'. The post has since gone viral on Twitter - shared more than 80,000 times and liked more than 220,000 times. According to the NZ Herald, waitstaff told Ms O'Hara the idea for the note came from the chef, Mark Simmons. Simmons, who competed in the US version of Top Chef, printed the following message on the receipt. The message, a reference to Trump's 'make America great again' campaign slogan, comes amid heightened immigration tensions across the US. President Trump signed executive order banning immigrants from seven predominantly Muslim nations, sparking outrage and protests the world over. A rude couple in Virginia failed to tip a waitress at an old-fashioned restaurant and explained their decision on their receipt. It’s discourteous not to tip your waitress at a restaurant, but to refuse to leave a tip because of their race is simply prejudice. 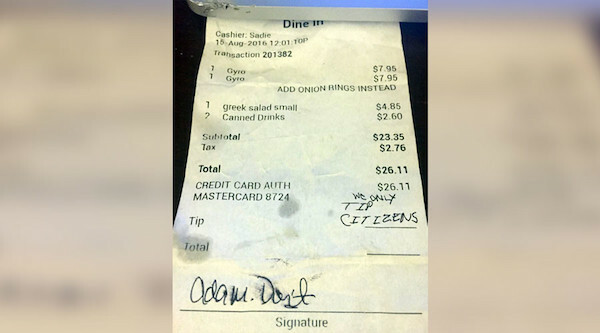 Adam Dart and his significant other declined to tip Sadie Karina, their waitress, and the couple insinuated that she was an immigrant and wrote on their receipt, “We only tip citizens,” Raw Story reported. The couple wrote their racist remark after dining at Jess’ Lunch Downtown in Harrisonburg, Virginia. 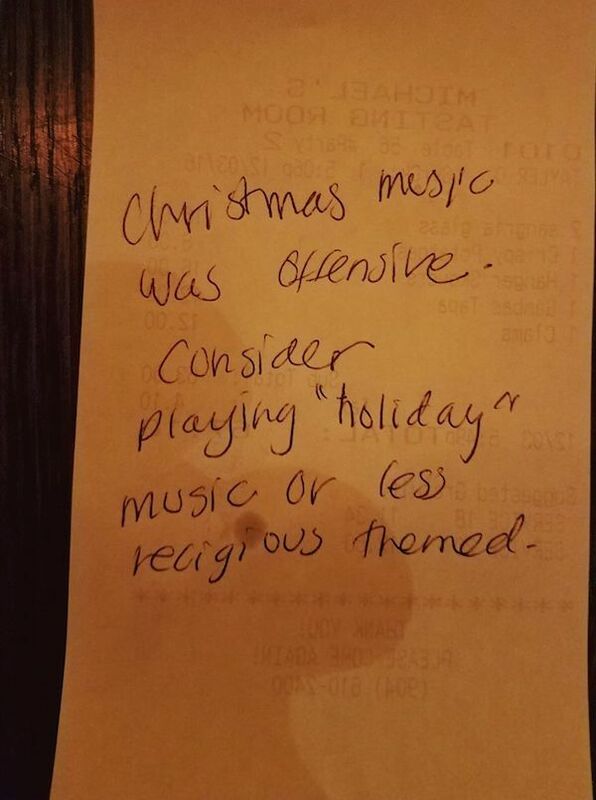 The chef at where this happened — Michael Lugo, of Michael’s Tasting Room in St. Augustine — says he got annoyed after a server showed him a complaint scrawled on the backside of a check that brusquely read: “Christmas music was offensive. Consider playing ‘holiday’ music or less religious themed.” He posted a pic of it on Facebook with a note of his own asking why diners whose only job is writing several numbers and signing their name have suddenly become the absolute worst. He tells First Coast News he’s actually cool with people complaining, but doesn’t think it’s fair to his staff: “Between social media and review sites I swear they are under constant pressure that someone is going to write something bad about us.” He says some of the music is Christian, sure, but he refuses to cater to anonymous guests who have “opinions about décor or opinions about Christmas music,” yet won’t tell anyone face-to-face. Future diners at Michael’s should prepare for a whole evening of “Do You Hear What I Hear?” ironically on loop. 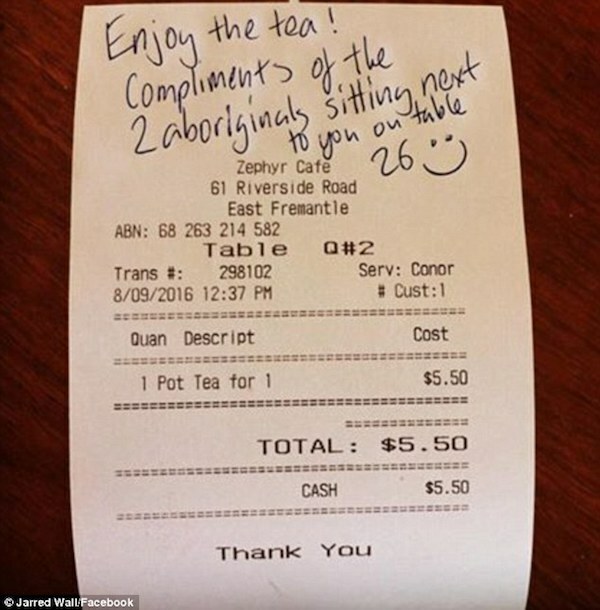 An Aboriginal man has given the perfect response to two elderly women who sat beside him at a cafe and made a number of racist remarks. Jarred Wall from Perth, Western Australia was dining at a cafe with a friend - also of Aborignal descent - when he overhead the discussion of the ladies next to him. Taking to Facebook after the incident, Mr Wall described the pair's 'distasteful' conversation, saying they discussed things including 'assimilation'. However, instead of going into an angry rage and unleashing a 'tirade of abuse' against the women, he did something nice in an effort to show them the error of their ways. 'I could have unleashed a tirade of abuse but that wouldn't have helped,' Mr Wall wrote. 'Instead, I did something nice and bought them a pot of tea and left a little note on the receipt. Accompanying his post was a photo of the receipt from the Zephyr Cafe in East Fremantle. 'Enjoy the tea!' Mr Wall wrote. Since being shared to social media the post has received more than 10,000 reactions and 1,300 shares. Hundreds have also shared messages of support for Mr Wall, praising him for choosing to be nice instead of stooping to the lows of the other two women. 'Love that. Doing the opposite of what you feel like doing... it's a powerful message that has a HUGE impact,' one woman wrote. 'Well done on taking the higher ground! English breakfast tea can melt the coldest hearts,' another man commented. (WHO) A popular waitress at a popular Des Moines, Iowa restaurant closed out one of her table's Tuesday night when she found a note from her patron. "At first, I felt really upset, I felt attacked, I almost felt like I was back in middle school all over again, like being bullied," Taelor Beeck said. "I felt like a burning anger inside of me." On a bill worth $17.26, the tip line was crossed out. "Tips are only for normal looking people," the patron wrote. According to WUSA 9, Rosalynd Harris was working her shift at the restaurant when she sat a table of men that she would later learn were from Texas and in town to celebrate Donald Trump’s inauguration. “It was an interesting situation because it is a Liberal, Democratic kind of feel to the entire Busboys establishment, the people that come in, the people it attracts,” she said. The three men, she would learn, were all from West Texas and in Washington, D.C. for President Trump’s inauguration. Harris and Busboys clearly made an impression on the men. According to the Washington Post, the group hit it off with Harris, despite their differences. When the men left, Harris was clearing the table and saw the note first. Then, she saw the $450 tip left on a $70 bill. ALBUQUERQUE, N.M. (KRQE) – Controversial speaker Milo Yiannopoulos drew a big protest Friday night at University New Mexico. Now, he’s creating even more of a buzz after the message he and some buddies left on a credit card receipt before they left town. The right-wing writer and a group of friends stopped to eat at Buffalo Wild Wings, near the airport, on their way out of town. When he paid, he also left a message on the receipt for his $139.81 tab. Yiannopoulos took a photo of it, then posted it to Snapchat. The writer admits he likes to provoke people wherever he goes, something New Mexicans learned over the past few days. “He just wanted to get a rise out of people and I think that’s the main reason for what he says or what he does,” Nathan Schroeder said. 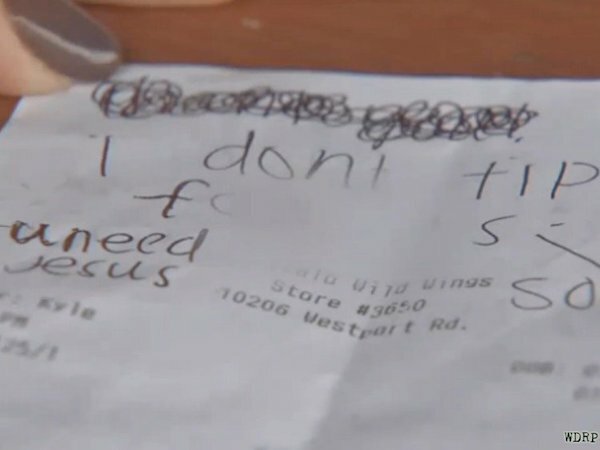 A manager at the Buffalo Wild Wings told KRQE News 13 the wait staff showed their bosses the receipt right away to prove they didn’t write the message. The manager also said someone from the group did end up leaving a cash tip on the table before leaving the restaurant. 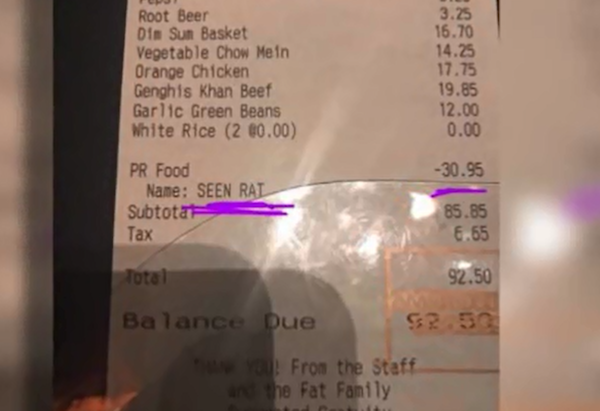 The manager of a California restaurant where a customer's receipt revealed a $30.95 "SEEN RAT" discount said his staff acted appropriately. A post circulated on Folsom-area Facebook groups during the weekend was written by a woman who said she was sharing the story on behalf of a woman who doesn't use Facebook. The post said the woman spotted a rat running around near her feet at Fat's Asian Bistro and notified the staff. The woman believed she would be speaking to a manager, but instead was handed a receipt by her server with $30.95 knocked off the bill for "SEEN RAT." Kevin Fat, chief operating officer of Fat's Restaurant Group, said the incident was highly unusual -- as was the note on the receipt. "The manager put it verbatim what the guest saw or stated, that's not normal practice," Fat told KTXL-TV. "In our 14 years in Folsom, we have not experienced something like this before." Fat said the restaurant manager was attempting to do right by the customer. "That's something that that manager at the time thought was appropriate, [it's a] learning lesson," Fat said. He said the eatery's staff acted appropriately and immediately contacted a pest control firm, which could not find any sign of rats in the building. The Sacramento County Environmental Management Department sent a health inspector, who also didn't find any signs of infestation. "For example there were no droppings, there were no live or dead bodies, no nesting, no gnawed food packages," the inspector wrote in their report. The inspector said the customer may have spotted a rat that temporarily sought shelter in the restaurant. "I think with the weather, it's possible that one came in, maybe the back door, and maybe wandered around the dining room and was chased back out," the inspector said. Fat said the company is taking the incident seriously and is attempting to contact the customer who had the experience. Sometimes you love something or someone so much that it makes you angry. You’re fuming because every time you try to work, create or live, that one thing is on your mind. It obstructs any rational thoughts you may have. And maybe that’s not always a bad thing. Sometimes it’s a person like the girl or guy you had a crush on in high school. At the time, everything they did was perfect and it’s obnoxious/embarrassing as all hell that you wasted as much time as you did thinking about them. F*ck, they had you hooked, borderline addicted, without even knowing it. Other times, though, in our more mature years, you fall hopelessly in love with someone’s writing or creativity. Not them, per se, but their work. You can’t begin to understand how they do what they do and you can’t stop appreciating it over and over, shamelessly re-reading passages ad nauseam. Sometimes, that love is a combination of both those feelings and it’s a made-to-order burger with a few strips of bacon and some chipotle mayo. 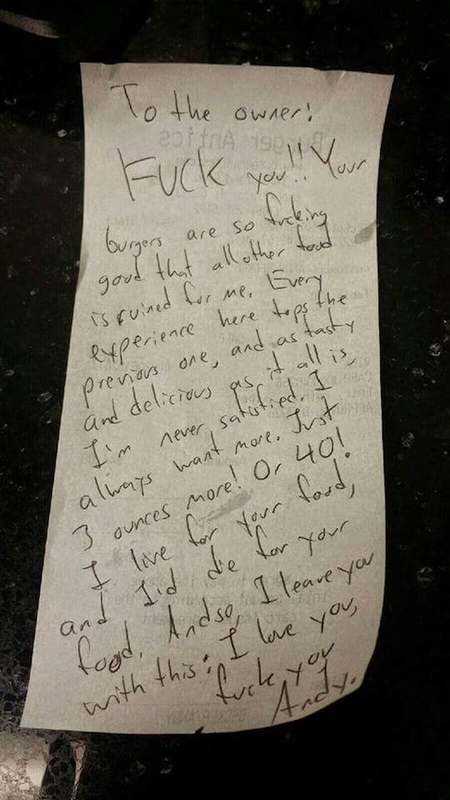 A receipt with an antigay slur went viral. 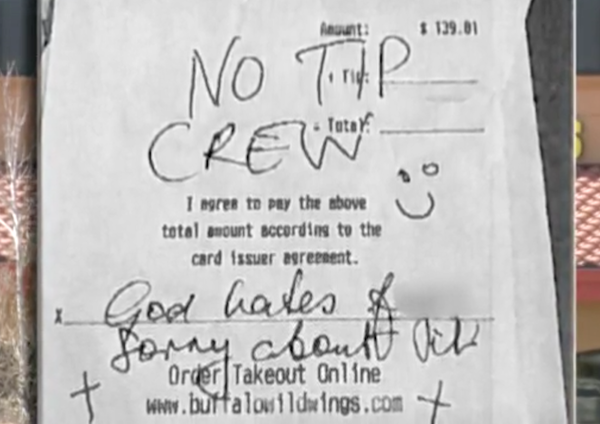 Kyle Griffith, a waiter at Buffalo Wild Wings in Louisville, Ky., received a hateful message instead of a tip on a recent bill of sale, after serving two young women. 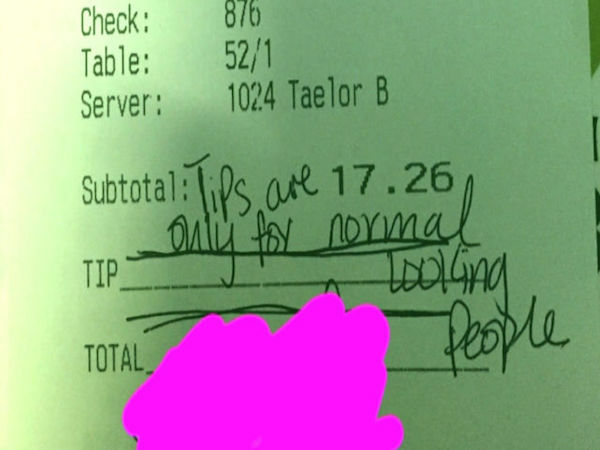 The message read: "Sorry I don't tip faggots," along with a hashtag, "#UNeedJesus." "It just crushed me that someone could say something like that,” Griffith told WDRB, a local Fox affiliate. "I depend on those tips to be able to pay my bills and everything else ... to live, to eat, everything,” he added. Afterward, Griffith posted a photo of the receipt to Facebook, in order to spread awareness of hate encountered by LGBT people. He took out the customer's name from the image to prevent a backlash against her. The post was later removed — it was flagged for offensive content, he said — but not before going viral. "I want to be able to tell everyone that this is not a lie, that this is truth, this is an everyday happening,” Griffith said. ”It's an occurrence that ... can't happen any longer. It's got to stop. The hate has to stop. There's no reason for it." Before the post was removed, the customer who had written the offending message apologized in the comments section of the photograph. She claimed that the remarks had been a joke. "It's not something you should joke about," Griffith shot back in his interview with WDRB. "My sexual preference at all shouldn't be something someone should joke about." Griffith added that Buffalo Wild Wings "had his back" throughout the ordeal. His employer released a statement in response to the incident. “We’re disappointed to learn about the comment left on a receipt by a Guest at one of our independently owned franchise locations in Louisville recently," the statement said. "Because Buffalo Wild Wings is about creating a great guest experience, we feel strongly that our restaurant environment needs to be respectful in order to provide the experience that our Guests and Team Members expect and deserve." Last Friday, Griffith posted a follow-up message that reiterated his wish for people to "stop spreading hate." 0 Response to "10 Craziest Shocking Restaurant Receipts"